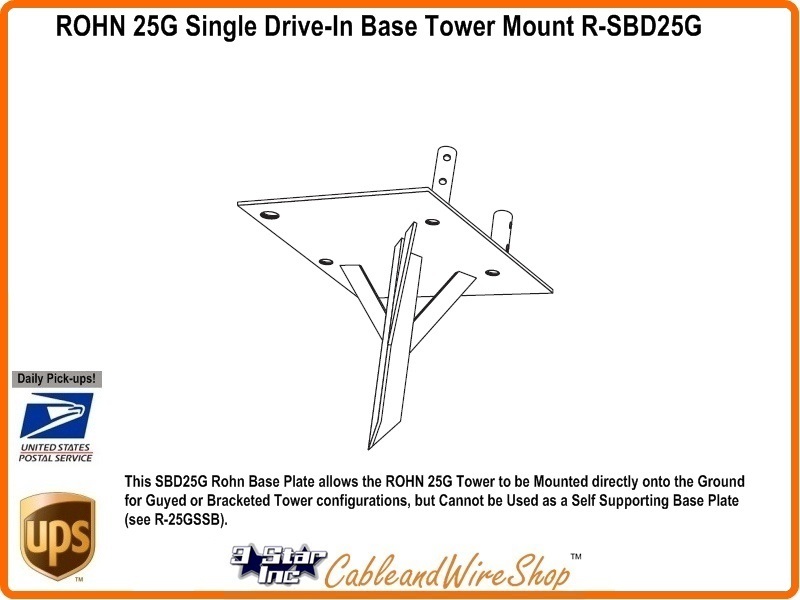 The SBD25G ROHN Base Plate allows the ROHN 25G Tower to be Mounted directly onto the Ground for Temporary Guyed or Bracketed Tower configurations, but Cannot be Used as a Self-Supporting Base Plate (see 25GSSB). This Tower Base uses double bolted joints which are proven to be the best method of joining tower sections for sturdiness and dependability. The 25G tower can be used inguyed, self-supporting or bracketed configurations according to specifications in the ROHN catalog. Unprepared Simple Ground Surface (Foundationless) Mounted Tower Options are Applicable for Temporary Tower Erection Scenarios. Consult ROHN Catalog Links at Footer Section below for ROHN 25G Tower Details. Note: There is no Simple Guidance for Simple Single Drive-In Ground Tower Base Loading and Height. This Base Mount for the 25G Tower is most applicable to Temporary Installations, and as such, would be limited to a height in consideration of Surrounding Structures and Load Bearing Soil Density. This ROHN 25G Tower Configuration should be Guyed at all Stages of Erection, Usage and Dis-Assembly.